I have been reading the latest edition of the Hardy Plant, enjoying the articles and reminiscing about the Society’s trip to Scotland in the early summer. It now seems such a long time ago. It has also been interesting to read the Tenth Anniversary Handbook of the Society from 1967 (click here to view), now on this website. It struck me just how relevant some of the articles are to today. I particularly enjoyed the article “Americans in the Border” as this is something I often do – walking around the world in the garden. My season of gardening visiting is over for the year and I settle down to take stock of my own garden, cutting back plants and moving ones that would be better planted elsewhere. I do not have the ability to visualise planting in 3D and always admire those who can. So plants are frequently on the move. However at the moment I am enjoying some of the fruits of last year’s autumn re-ordering. Chrysanthemum ‘Bretforton Road’ is looking stunning with pride of place in the main border facing the house. Chrysanthemums always remind me of my mother, who grew some wonderful ones, and of harvest festivals as a child – just the smell of the flowers in an enclosed space is enough to take me back years. C. ‘Bretforton Road’ is a late flowering variety that will continue well into December with bright deep pink flowers. I now see that to enjoy it at its best I need move the aster that is behind it, and now cut down, and replace it with an evergreen plant to show off its neat habit. A euphorbia perhaps? I am not really a reminiscing person, generally I prefer to be planning for the future. October is a month of meetings for me with the annual get together of the Society’s Group Secretaries, a Trustees’ meeting, and an officer’s meeting, reviewing the year and planning for next year. I also attended the annual exchange of plants in the Society’s Plant Conservation Scheme. This is always an exciting time. The aim of the Scheme is to ensure that rarer and lesser-known perennial plants are conserved and made available to gardeners generally. The plants are grown by members in many parts of Great Britain, propagated, swapped, reported upon and when stocks allow made available to nurseries and other gardeners through local plant sales. The meeting is a buzz of the lively discussion about the plants – just what this Society is all about! The coordinating group are planning developments for 2013 and beyond, so watch the Conservation area on the website. Enough for now – back to the garden! 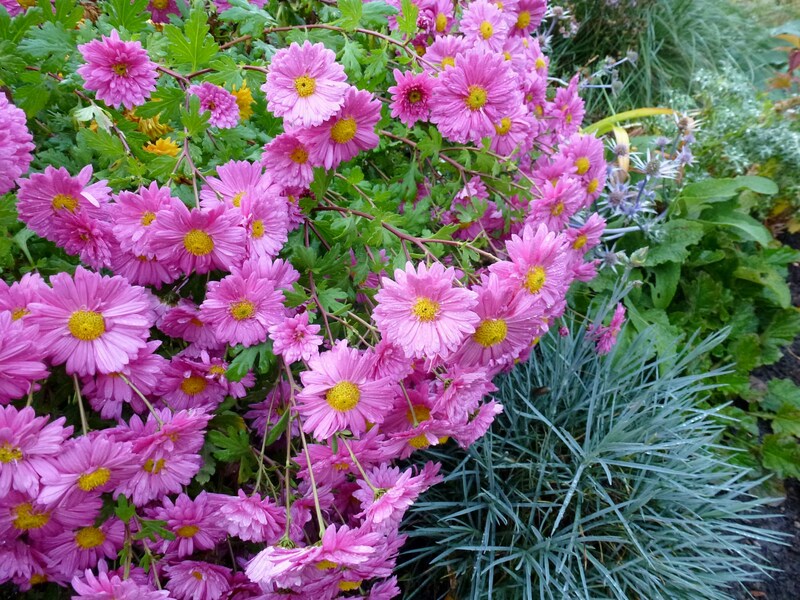 Posted on November 3, 2012, in National Chairman's Blog, News 2012 and tagged Blog, Chrysanthemum, Chrysanthemum ‘Bretforton Road’, group secretaries, HPS Chairman, nature, October, Vivienne McGhee, walking around the world. Bookmark the permalink. Leave a comment.